The pattern of the Pensée dress (and camisole) contains two variations. Version A is belted, with two long ties that go around the waist, crossing in the front to be tied together in the back. Version B has a looser fit, with two smaller ties that are just tied on the left side. Here I’m showing you my third unofficial version: it’s actually version A, just tied differently! Version A of the dress has a tiny loop in the left side seam, in which you insert the tie of the overlay panel so it stays exactly at waist level. To tie the dress like I did on these pictures, you just need to insert the tie in the loop, then bring it to the back to tie it with the right-hand-side tie. This cinches the back, while letting the front of the dress fall straight. I don’t always wear my Pensée dress like this, but I like that it’s an option for a change! 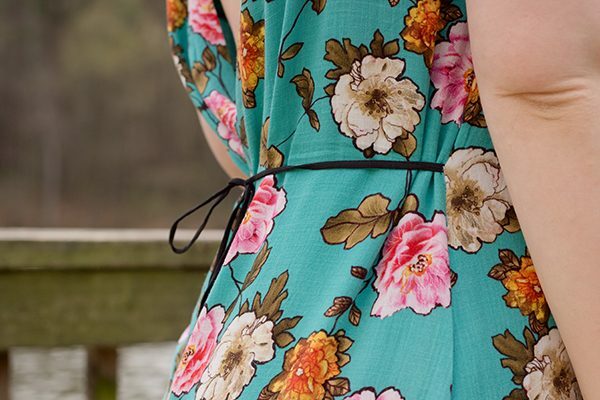 Let’s go back to the beginning: Pensée is a dress with thin straps and a deep V neckline, to sew in drapey fabrics. The cross-over back is more or less low depending on fabrics, body shapes, and, as is the case here, how the dress is tied. With the ties like this, the panels cross maybe 10 cm lower than on the version I’m wearing on the shop pictures, almost at waist level, and I like the open-back look a lot! For this version, I graded from a size 38 at the bust/waist to a size 40 at the hips. I think I also lengthened the skirt by using the length of size 42, but I’m not 100% sure. I sew a lot of muslins and more or less wearable versions during the pattern creation process, and even though we’re really organized at work, once the collection is out sometimes I have trouble finding that info in my personal notes! I think lengthening the dress is needed as usual as I’m taller than the Deer&Doe stature, but on my next version I might sew a size 38 all-over for a straighter fit. The fabric I’ve used is a rayon challis from Telio, and I love it. It’s part of a Frida Khalo inspired collection, and has a slub texture with threads of different thicknesses. It’s really pleasant to wear, once again I’m delighted with the quality of Telio fabrics. The only issue I’ve had was that this fabric is loosely woven and frays a lot: it was impossible to turn the rouleau loops to the right side without them falling apart! After a few failed attempts I decided to cut new ties in the leftover scraps from another Pensée top in a black poly satin (soon to be on the blog). This was such a happy accident, as I think the dress looks so much better with these contrasting ties and straps! Since the flowers in the print have a black outline, it really looks like I did it on purpose. 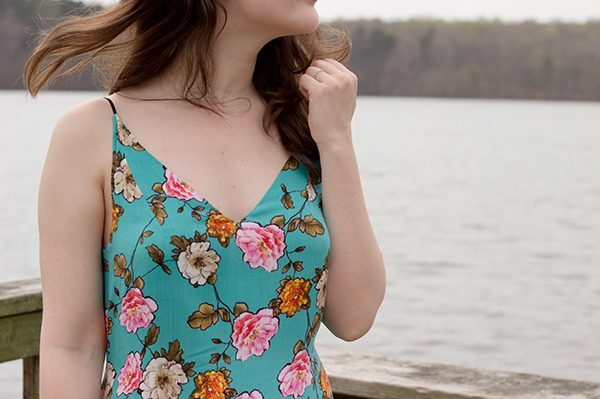 I love everything about this dress: its shape, fabric, details… I haven’t worn it a lot yet because of the weather, but it will be perfect for the summer. In North Carolina, it can be very hot and especially very humid as early as May. I often wear sleeveless dresses in these situations, but even Centaurée sometimes feels like too much fabric. I think Pensée will be absolutely perfect to face the heat! 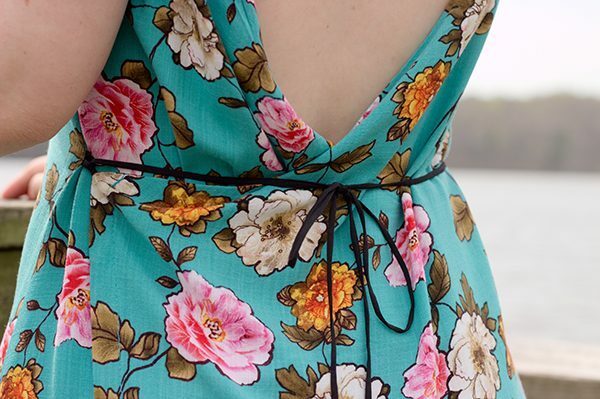 I love those detail shots– the way to tie it in back (and breezeproof side seams) are wonderful details i wouldn’t have noticed otherwise! I really love your dress! It’s just what I am looking for. 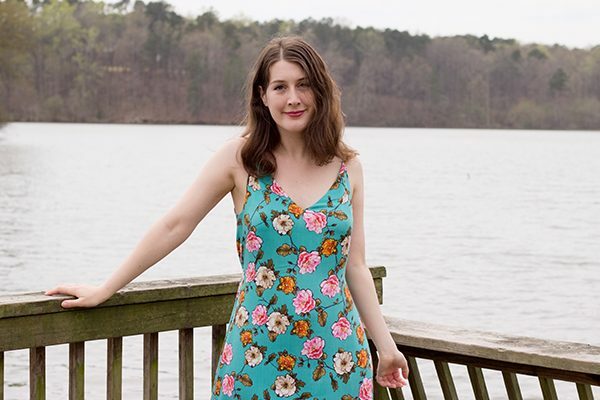 For some days now I’m thinking about my perfect summer dress and I already got upset because I just couldn’t find an appropriate pattern. Thanks a lot for that inspiration!